Striker Demba Ba insists he can still have a long-term future at Chelsea despite being interested in joining Arsenal before the transfer deadline. The Senegal forward, 28, only joined the Blues from Newcastle in January but was a summer target for the Gunners. He is sure he can force his way into Chelsea boss Jose Mourinho's plans. "I was ready to go and play [for Arsenal] but it didn't happen. I'm a good professional and will keep doing the same," Ba said. Chelsea (2013): 15 appearances, two goals. Newcastle (2011-13): 54 appearances, 29 goals. West Ham (2011): 12 appearances, seven goals. With Arsenal looking to increase their attacking options, they were interested in signing Ba, only to be told Chelsea would not loan him to a rival. He has played just 65 minutes for the Blues this season, in the 2-1 win over Aston Villa in August. And the arrival of Cameroon striker Samuel Eto'o from Anzhi Makhachkala is likely to have a further impact on his chances of regular football. But, with a contract running until 2016, he is sure he can still prove himself under Mourinho. 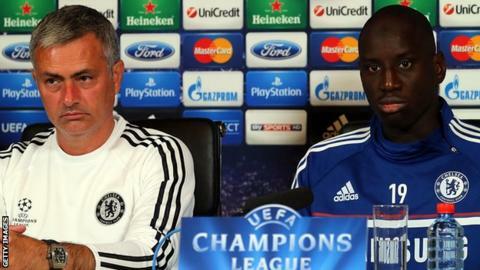 Asked if he wanted to leave in the summer, Ba said: "I wanted to play and I want to play. "It all depends on me and the performance I put in on the pitch. If I play well, I will deserve to play and the manager will put me on the pitch because that's how he is and if I don't perform, it will only be my fault. "I think the boss said it and I spoke to him before. I won't tell you what we said on the phone but I told him that if I stay, I will keep fighting for the club. Now the matter is the next years with Chelsea and that's it."